In L.B. Sedlacek’s collection, Words and Bones, we see the wonder of every day miracles presented to us using spare, but precise language, and imagery that opens up the sky and earth in unique ways. 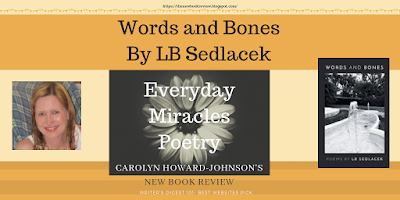 If we follow the thread of words in these engaging poems, we not only find our way out of the forest of life, we emerge with a deeper understanding of human connection, ways of seeing, and inner knowing. These are poems to be savored and sipped. These words and bones shed light on the mysterious world around us and skillfully offer a poetic guide map. Cristina M. R. Norcross, Editor of Blue Heron Review; author of Beauty in the Broken Places and other titles.